We exist for a very simple reason – to advance banking and finance by providing outstanding education and thinking, tailored to the needs of business, individuals, and society. Our focus is on lifelong learning; equipping individuals with the knowledge, skills and qualifications to achieve what they want throughout their career and life. We provide a balance of experience, insight and thought leadership into today’s financial world, delivered by industry leaders, thinkers and members of our community. And because we’ve been at the heart of the sector since 1879, we create connections and build partnerships between people and business that make banking and finance more accessible and understood, and enhance social inclusion through better financial capability. 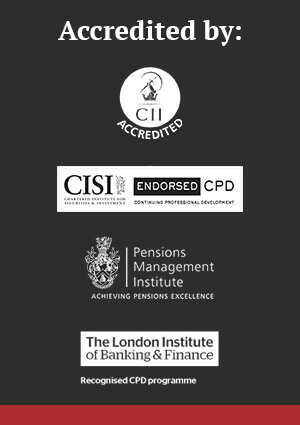 We are The London Institute of Banking & Finance, lifelong partners for financial education.